By protecting sensitive reefs, restoring damaged reefs and building new reefs a coral reef can be helped in its further existence. Considering that coral grows slowly, there is much work to be done in the upcoming years. The plan is therefore to plant coral reefs in a structural way. The organization also sets up educational projects as to show what more there can be done to conserve coral reefs. 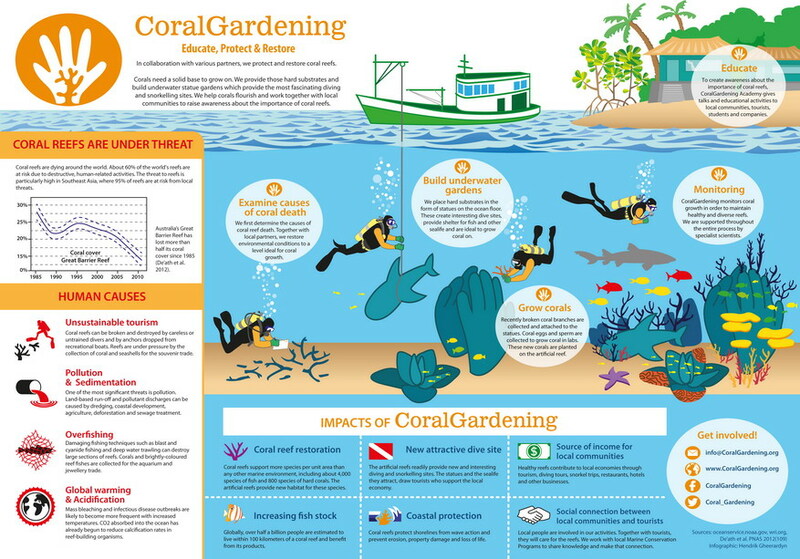 The protection and restoration of coral reefs and the planting of coral gardens where coral can be grown is a new sector. It is a branch where many people are employed in. Local fishermen share their knowledge of the areas where reefs produce a small amount of fish, reefs have died or need to be conserved, and we support them with the performance of this conservation. They are sustainably employed to restore the coral reef.